but this isn’t unique – they also drink at a wide variety of other flower species. 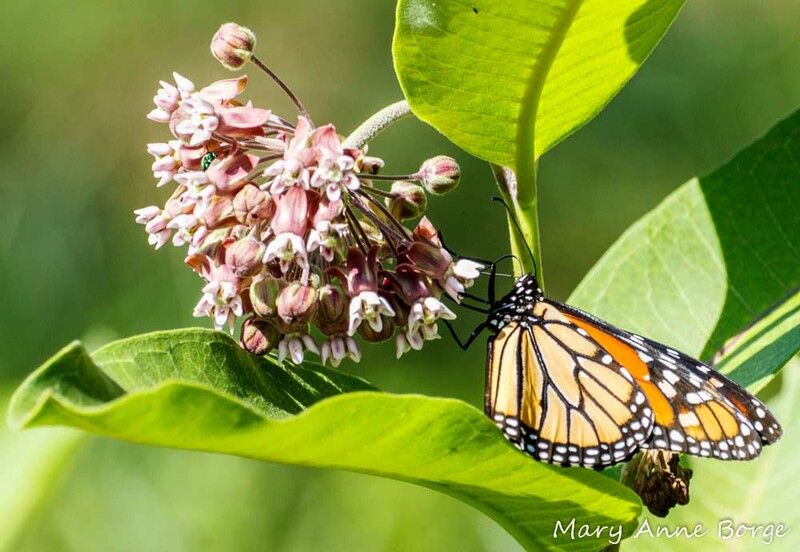 It’s the dependency that Monarchs have on Milkweeds as the only food source for their caterpillars that makes this relationship so noteworthy. 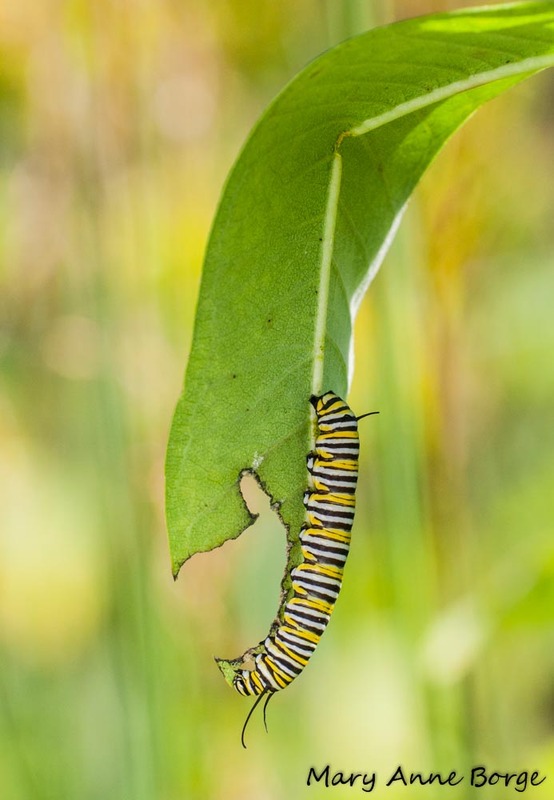 Monarchs, like many species of insects, have evolved to specialize in their larval (in this case caterpillar) food source in order to gain protection from predators through the chemicals they ingest from the plants they eat. Milkweeds contain cardiac glycosides, which are toxic to many species of birds and mammals. Plants have evolved these chemicals to protect themselves from being eaten, a strategy that has largely been successful for the plants. Plants are all about surviving and reproducing, to further the continued existence of their species. Such a plan for protection is never completely foolproof, however. 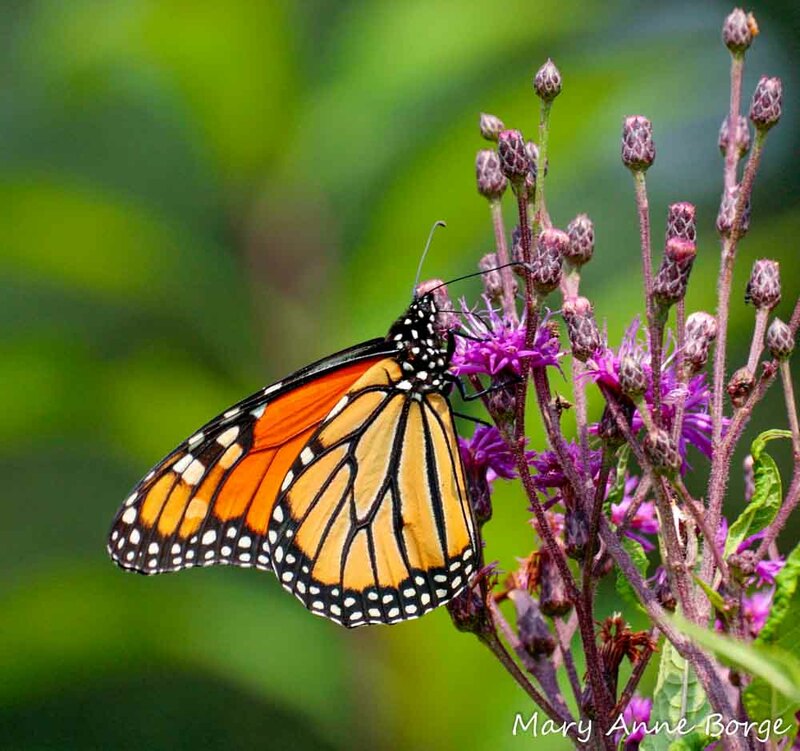 Monarchs, along with some other insect species, have evolved to be able to digest these plants and sequester the toxins in their bodies, making the insect unpalatable at best and toxic at worst to anyone inexperienced enough to attempt to eat them. As a reminder to bird or mammal predators who sample such an insect and survive to eat another meal, insects with these toxins have also evolved to have bright warning colors, an easy to remember signal to predators to beware before attempting such a meal again. 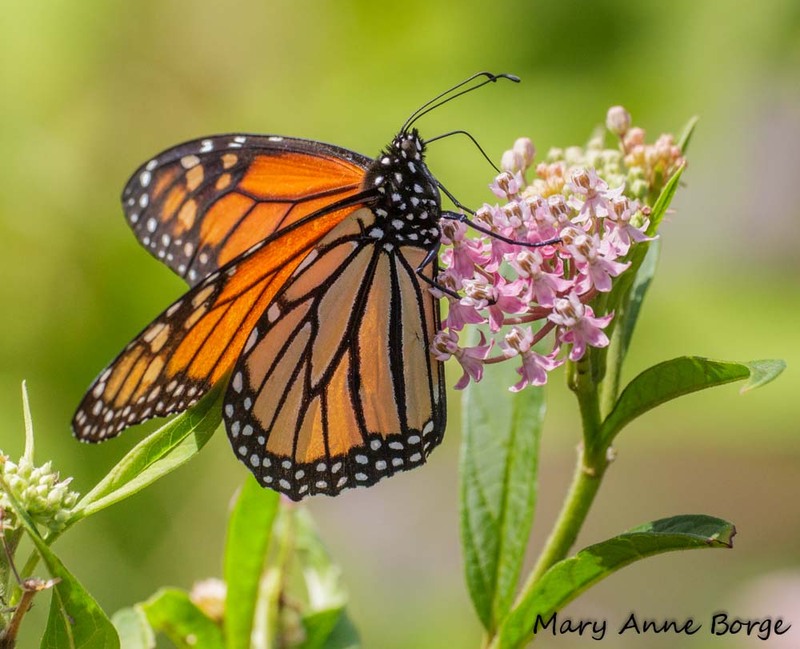 In exchange for this protection obtained from eating Milkweeds, Monarchs are gambling that this food source will continue to be available. Without it, Monarchs won’t survive. 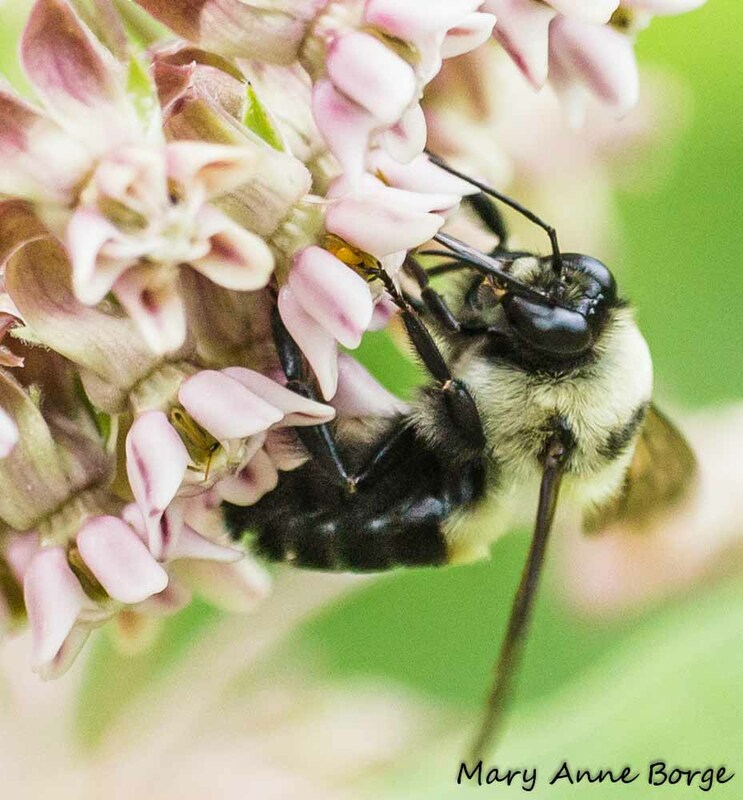 as well as other milkweed species are also favorites of butterflies, bees, and other insects that are nectar feeders, for their reliable, sweet, high energy food. 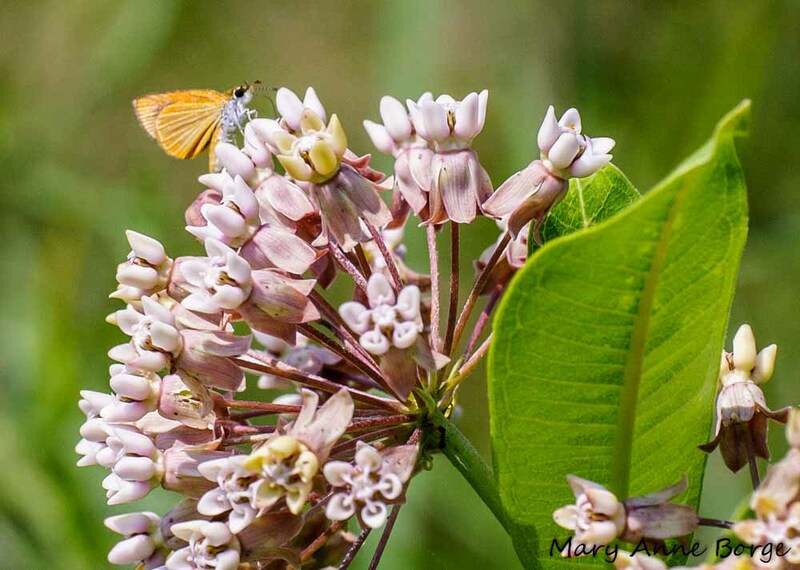 Butterflies benefit from the food offered by milkweeds, and in return they do help the plants with pollination, but they are not the most successful pollinators of milkweeds. 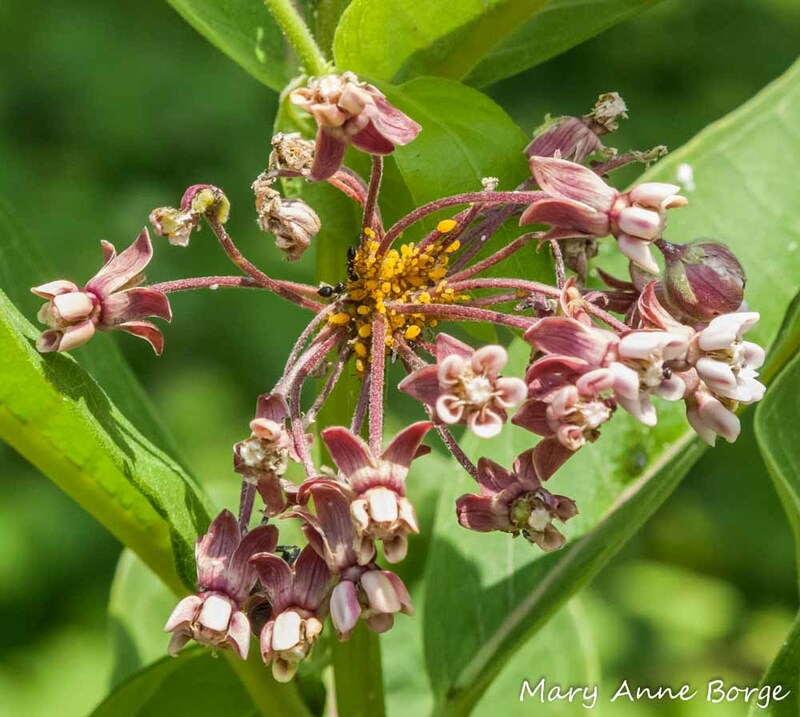 Milkweeds have bundles of pollen, called pollinia, that are linked in pairs by a thin filament. This connector snags an insect appendage that is inserted in just the right spot in a flower. An insect has to approach the flower in a way that will engage the filament connecting the pollinia, and it must also be robust enough to remove the pollinia from the flower in order to assist the plant in cross pollination. The pollinia is carried by the insect to another flower, and inserted by the same mechanism. Take a look at the Eastern Comma below. It’s perched on top of a flower, using its straw-like proboscis to sip nectar from a Common Milkweed (Asclepias syriaca) flower. 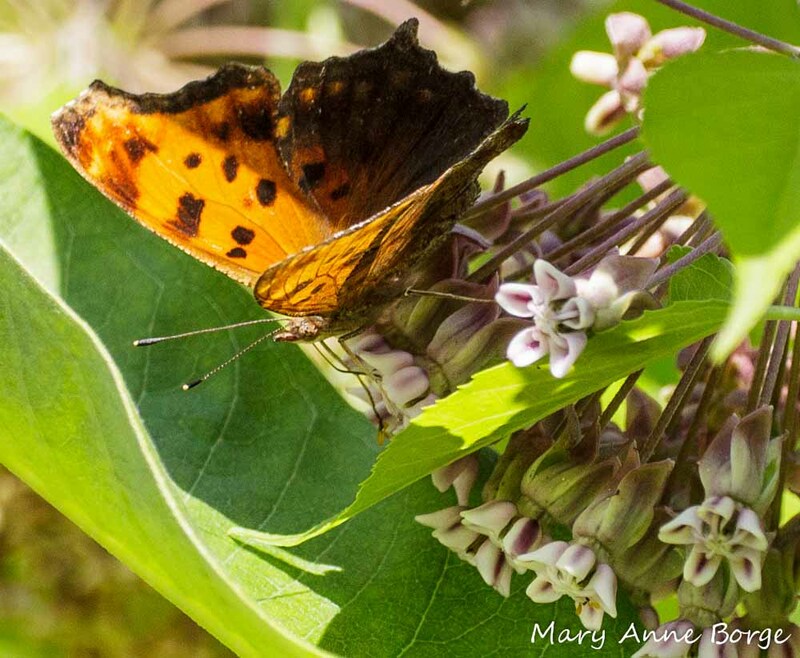 With this approach, a butterfly isn’t that likely to be helping this Milkweed out with pollination. This Bumble Bee, on the other hand, is facing the flower, with its left front leg inserted in the very location where the pollinia are stored. This bee is engaging the pollen sacs, and has the heft to be able to escape from the flower with them clinging to its leg. If you look carefully at the bee’s left front leg in the photo below, you can see the yellow pollinia attached to it. 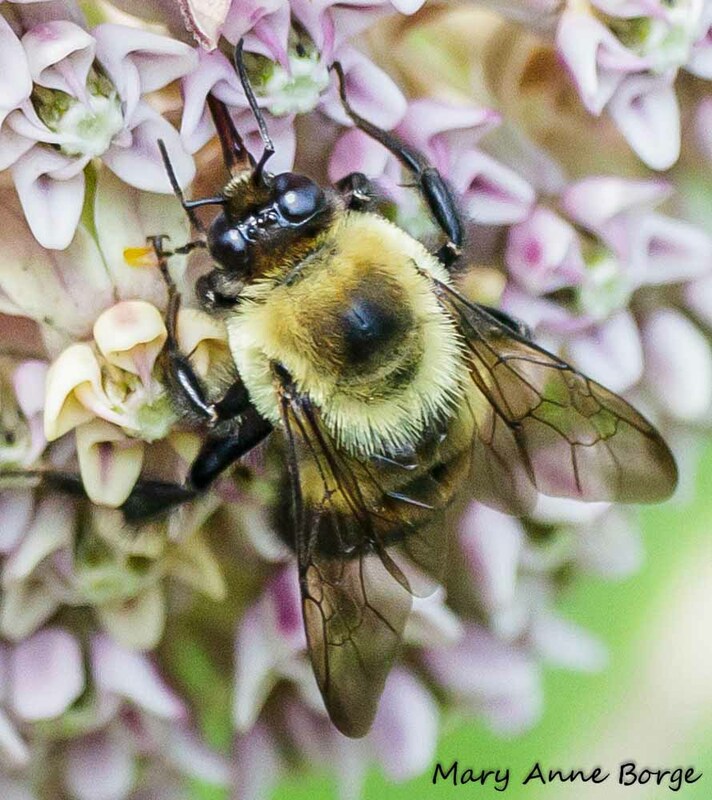 Large bees, such as Bumble Bees and Carpenter Bees, are among the most successful intermediaries in Milkweed pollination. 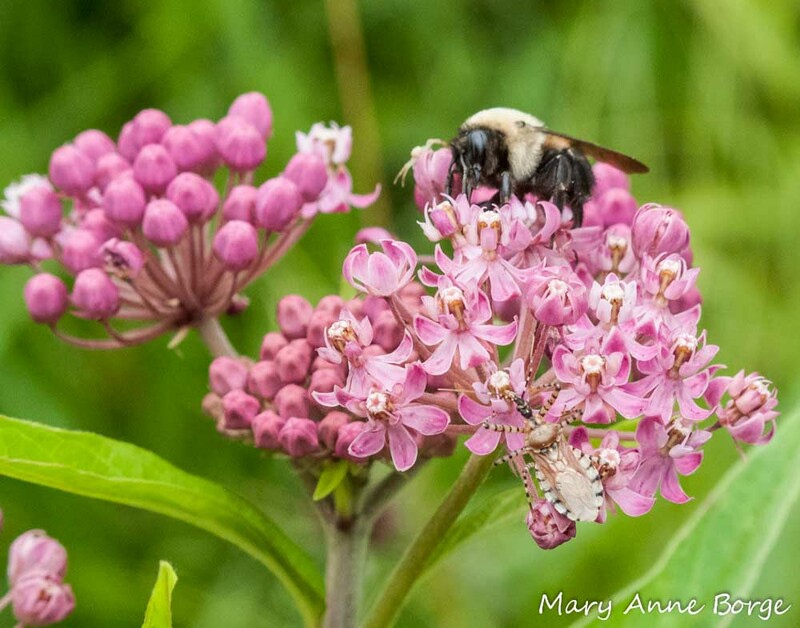 Common Milkweed flowers release a potent fragrance to attract bees to assist them in their reproduction. 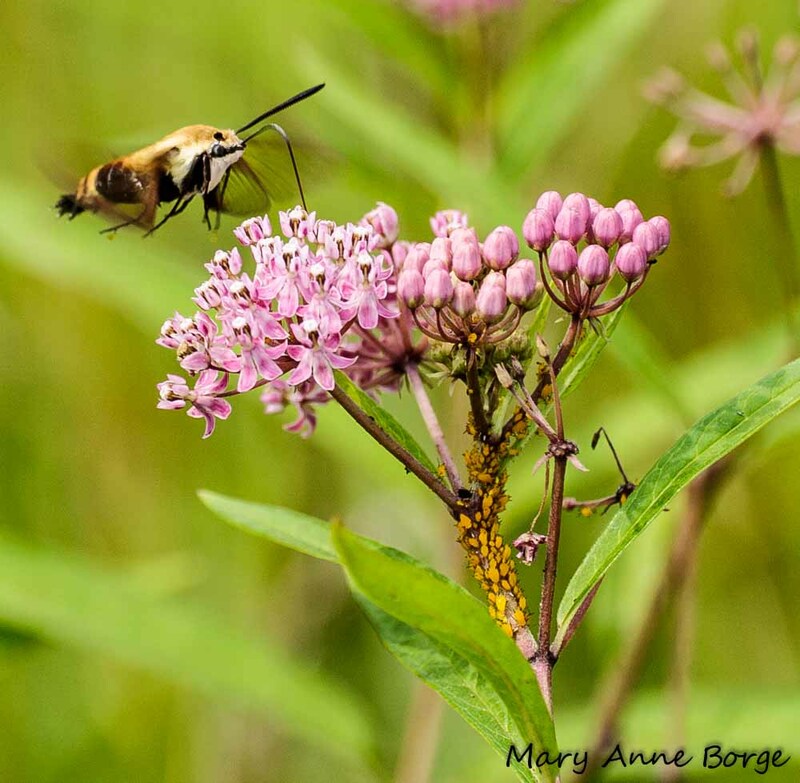 Many other insects take advantage of the nectar bounty offered by Milkweeds, including the Snowberry Clearwing Moth (Hemaris diffinis). There’s another insect species dining on this Swamp Milkweed. Do you see the little yellow critters on the stem? You might be thinking, “Eeuuw! Aphids!” If so, you would be half right. These are Oleander Aphids (Aphis nerii), a species frequently found on Milkweeds. But you might want to re-think the “Eeuuw!” It turns out that aphids are an important part of the food chain. Aphids rarely really harm a plant. And they offer a sustainable food source in the form of honeydew, a sweet excrement that ants love. The ants protect aphids in exchange for this tasty meal. Ants are essential for aerating soil, decomposing plant matter, dispersing seeds, and in some cases protecting plants from other predators. Lady Beetle larva biting aphid that shows signs (bubble) of being parasitized by a braconid wasp. If you’re really observant you may have noticed that this scene was taking place on half of a Common Milkweed leaf, with the right side of the leaf missing. Wondering how that happened? It’s the way Milkweed Tussock Moth (Euchaetes egle) caterpillars feed, neatly chewing side by side, stopping at the midrib. Another insect that feeds on milkweed leaves is the Red Milkweed Beetle (Tetraopes tetraophthalmus). This clever creature bites through the midrib of the leaf in a few spots near the leaf tip. This stops the milky latex-like sap from flowing to that part of the leaf, making it possible for the beetle to eat it without having its mouthparts glued together by the sticky substance. 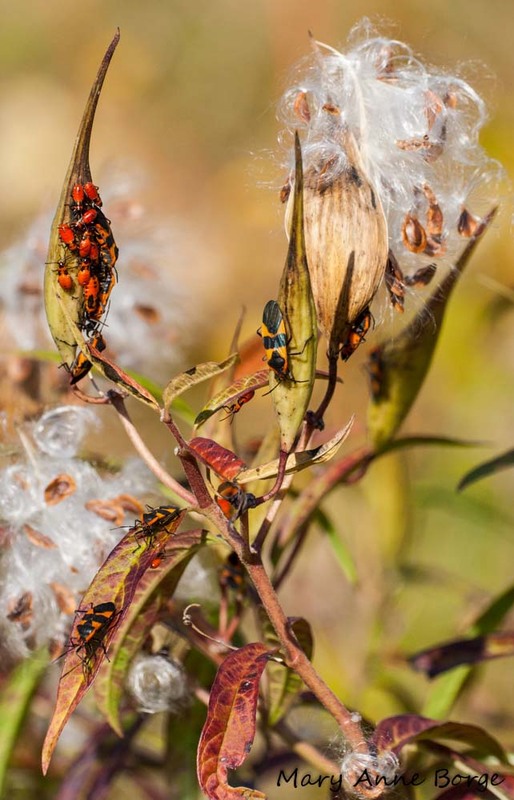 Even Milkweed seeds are a source of food for insects like the Small (Lygaeus kalmii) and Large (Oncopeltus fasciatus) Milkweed Bugs. Adults may also consume nectar. All of these insects sport bright colors that warn birds and mammals to avoid eating them. Insect and arthropod predators including the Lady Beetles, wasps, assassin bugs, spiders and Praying Mantises (or Mantids) are not put off, however. They may consume not just nectar feeders, but foliage and seed feeders, too. Many of these predators are safe for birds and other predators to eat. 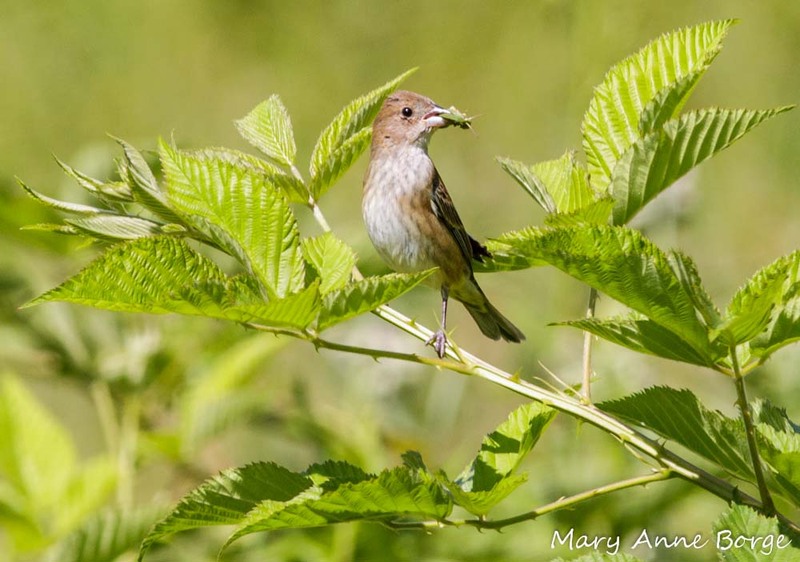 A large percentage of a bird’s diet consists of insects, especially when they are raising their young. 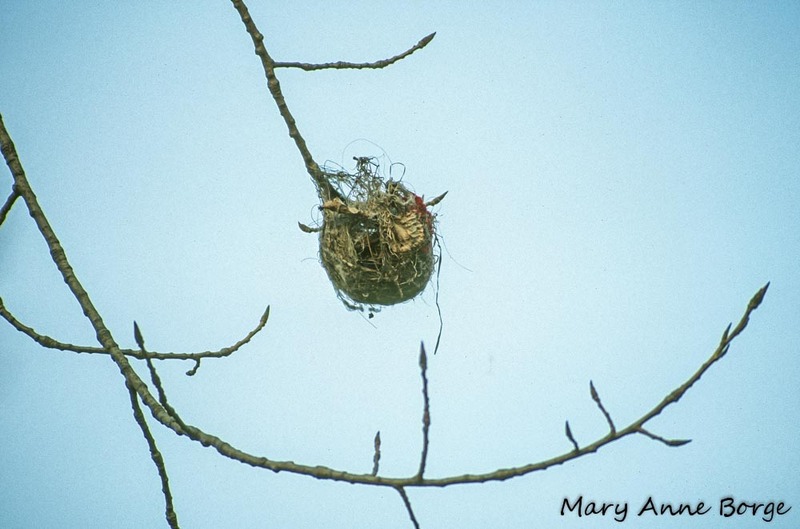 Birds also benefit from Milkweeds by using them as nesting material. The fluffy hairs attached to the seeds can make a soft lining for a Goldfinch nest. 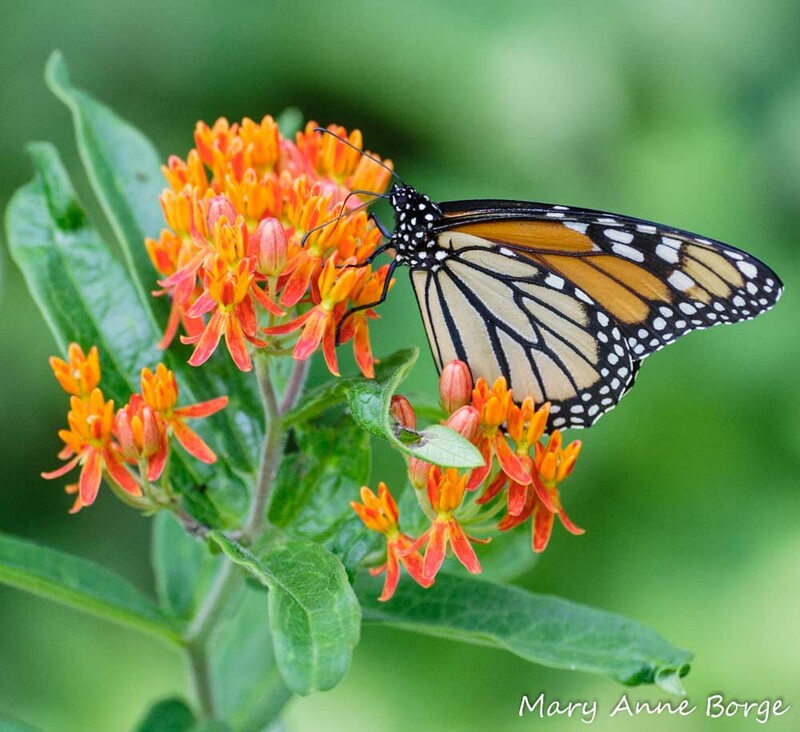 Milkweeds are essential to the continued survival of the Monarch butterfly. They are a copious nectar source for our beleaguered bee populations, and offer food to many other beneficial insects. They’re a source of insect protein and nest material for birds and other animals. 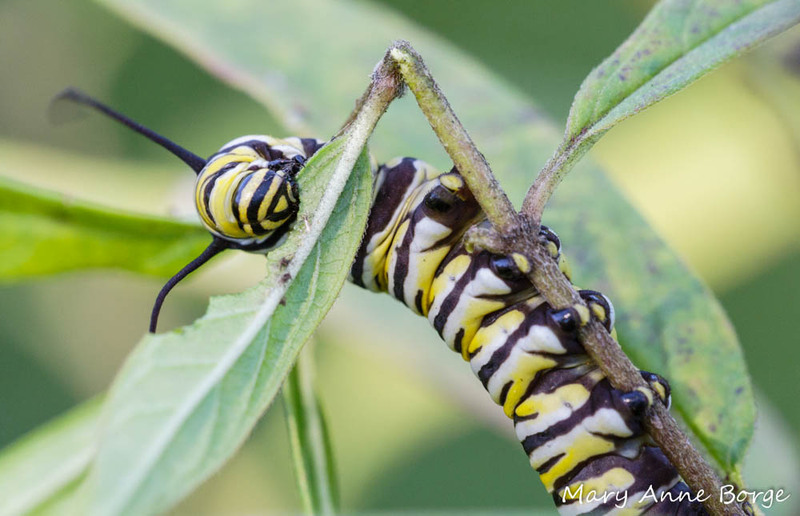 Milkweeds – they’re vital for Monarchs, and a whole host of other species, too. 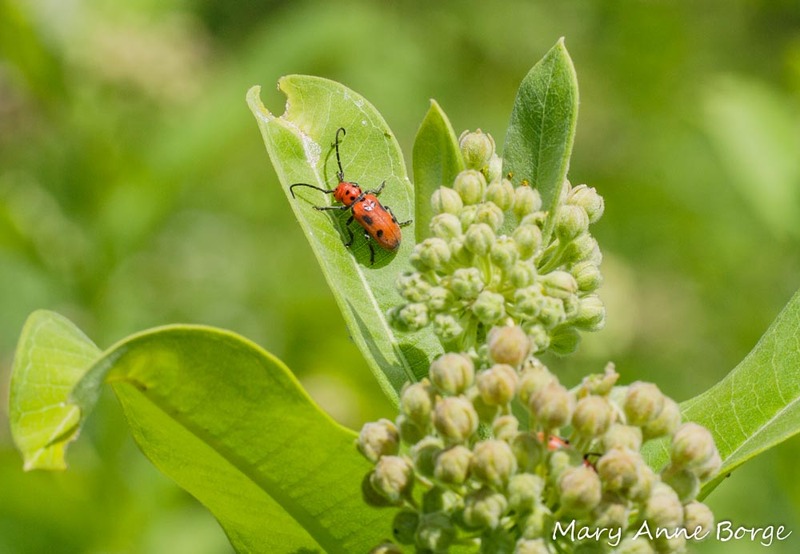 This entry was posted in Birds, Butterflies, Native Plants, Other Insects and Spiders and tagged Bees, bumble bee, Butterflyweed, caterpillar, Common Milkweed, Large Milkweed Bug, Monarch, nature, Northern Oriole Nest, Oleander Aphid, Red Milkweed Beetle, Small Milkweed Bug, Swamp Milkweed, Yellow Warbler by Mary Anne Borge. Bookmark the permalink. What an informative post! It takes time to collect such a diverse number of photos, let alone put all this info together. Your thoroughness and resources are appreciated. Well, yes, I’m aware of the hazards of tussock moths on both counts. .Some info I read suggested they’d be OK, but I’d rather not risk the mantis so I collected some squash bugs and a cucumber beetle. Planning to set up a moth trap tonight to catch some of those to offer it as well. The old folks at our senior center enjoy the critters I bring in (along with text & photos of how it all happens). The mantid & its potential victims are in a separate terrarium, of course!! Hi Barbara! I agree this has been a good year for Monarchs. I’ve seen lots of them all summer long, starting in mid-May. 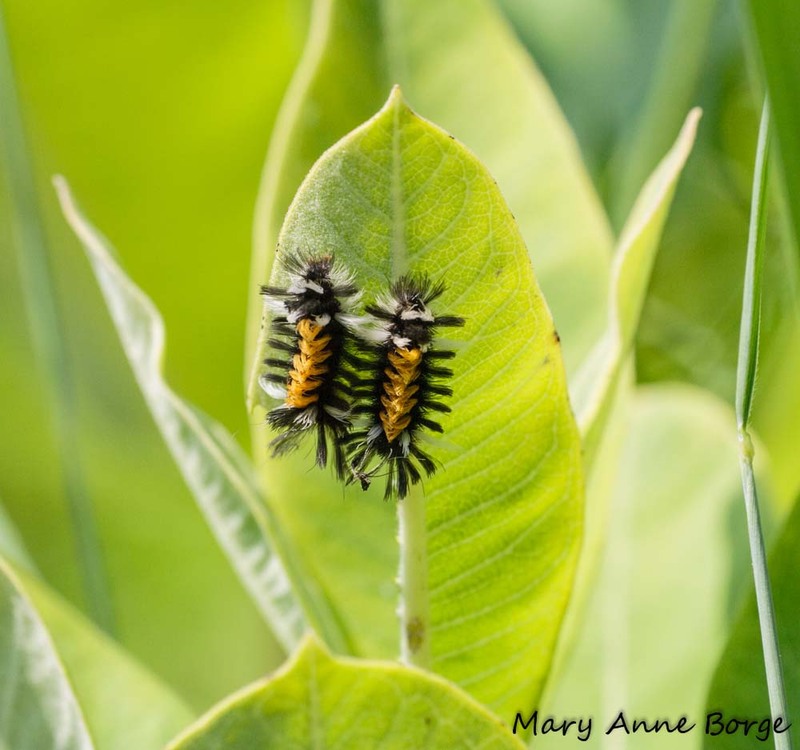 The Milkweed Tussock moth caterpillars aren’t harmful. I would let them do their thing. I think you may still see Monarchs in Maine for another several weeks, so you may want to delay mowing until later in October. Great info! 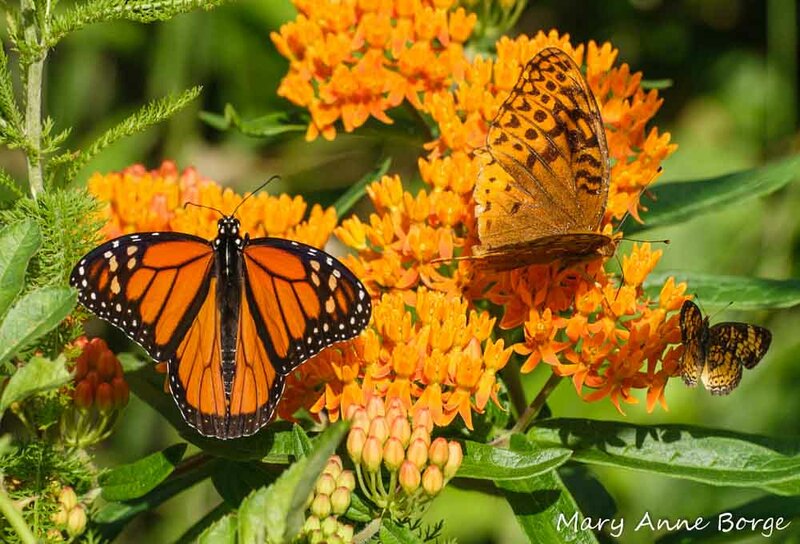 Some of the best articles on varied plant and insect cause and effect of Monarch life cycle success story. 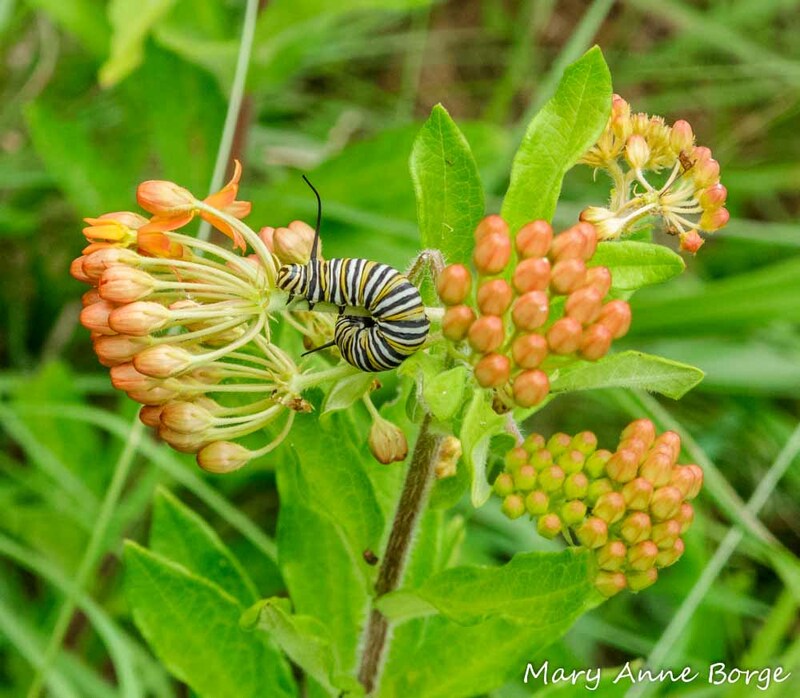 I assume the milkweeds that grow naturally on my wildlife habitat preserve are the ones Mother Nature provides for safe reproduction cycle of Monarch Butterflies. I have seen Monarchs increasingly and notice their caterpillars on the milkweed. I am thrilled to have this opportunity to study up close, along with all other wildlife species since transforming 17 acres of cattle pasture to a wildlife habitat for the past 14 years! This is our second such project, (and last)! Congratulations on your successful conversion of cattle pasture to wildlife habitat! This seems to be a good year for Monarchs. I’ve been seeing more of them than I have in years. Very informative article. I raise monarchs from the eggs I find on my common milkweed I allow to grow in my flower garden. ( I live in Mass.) This year, I am finding caterpillars with white fuzz all over their bodies on my milkweed also. They have a pair of longer black bristles on their back at both ends. Any idea what these are and if they are a threat to the hatching monarch eggs? Thanks, Beatriz. Looks like a good candidate. White tussock moth cats with black bristles front & rear sound like hickory tussock cats, which infest my black walnuts, too. They are EVERYWHERE in summer and fall, when they convert to bristly tan cocoons, which I find stuck in all sorts of hidden locations – under and behind bark, boards, woodpile, anything left on the ground, in my sheds, etc. I haven’t seen ANYTHING with a hickory tussock cat in its mouth – they must taste awful! I’m in the Finger Lakes Region of Central New York. Thanks for the article. Helped me figure out that one of my milkweeds has a ton of tussock moth caterpillars on it. Hoping I can get some monarchs Had to relocate a praying mantis off another milkweed to keep him from the butterflies. Hope he eats in the vegetable garden instead. Many of the Praying mantises we see are actually non-native, and can get pretty aggressive about eating other native insects. My husband, naturalist man, found something we had never seen. On a milkweed, while looking for Monarch eggs. 2 eggs, bigger than monarchs look like two tiny pearls. Any ideas? I actually don’t know, but one possibility is stink bugs. They are not picky about the species of plants on which they lay their eggs. I planted Milkweeds two years in a row and though they were beautiful during the summer, they don’t return for me. I even helped the seeds disperse in the garden after the pods opened hoping they would multiply. Will get them again this year but wondering what it takes to grow them well. They can be tricky. Do you know what species you planted? What was the site like in terms of sun, moisture, soil? You might try adding some mushroom compost, or mycorrhyzal fungi to the soil when you plant them. They should be available at garden centers. Most plants get the soil nutrients they need in partnership with these fungi. If the fungi are not present in the soil, the plants won’t do well. Thanks! I know two were swamp milkweeds I bought from Catus Island and they did well the first year and not so well last year. They are planted in an area that is sandy and also where a tree stump was ground down after Sandy toppled the tree. The other one was very pretty yellow and red and bloomed all summer in Sandy soil with leaf mulch but didn’t come back the following year. I am not sure what it was. I found it at Walmart in the sale plants for $5 and grabbed it :). Looking at your photos I would say it was probably butterflyweed. I’ll try enriching the soil as you suggest and see what happens. I haven’t tried any of the items you suggested. Swamp Milkweed likes moist soil, so keep that in mind. The other milkweed you described (yellow and red) sounds like Tropical Milkweed, which may not be able to survive the winters this far north. You’re better off with Butterflyweed (Asclepias tuberosa) or Swamp Milkweed (Asclepias incarnata). There is also a Purple Milkweed (Asclepias purpurascens), and some others. Good luck! That explains it. That soil is definitely not moist. I’ll do some soil work on the swamp milkweed and put in butterfly weed. Thanks so much for the help! 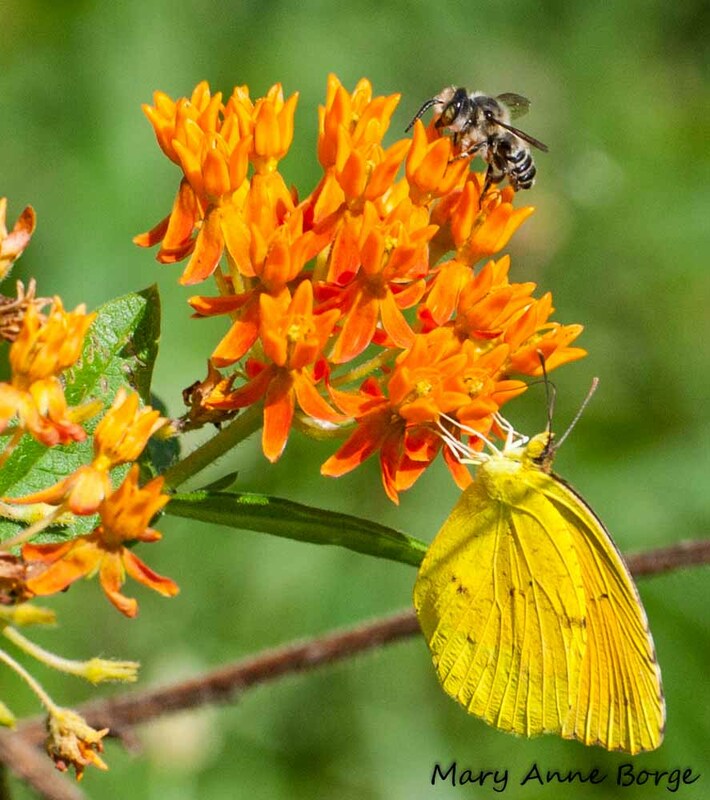 Butterflyweed can tolerate drier soils, so it may be a good bet for you. Thank you for your wonderful article. I have started raising Monarch catapillars and I’m very new to this conservation effort. 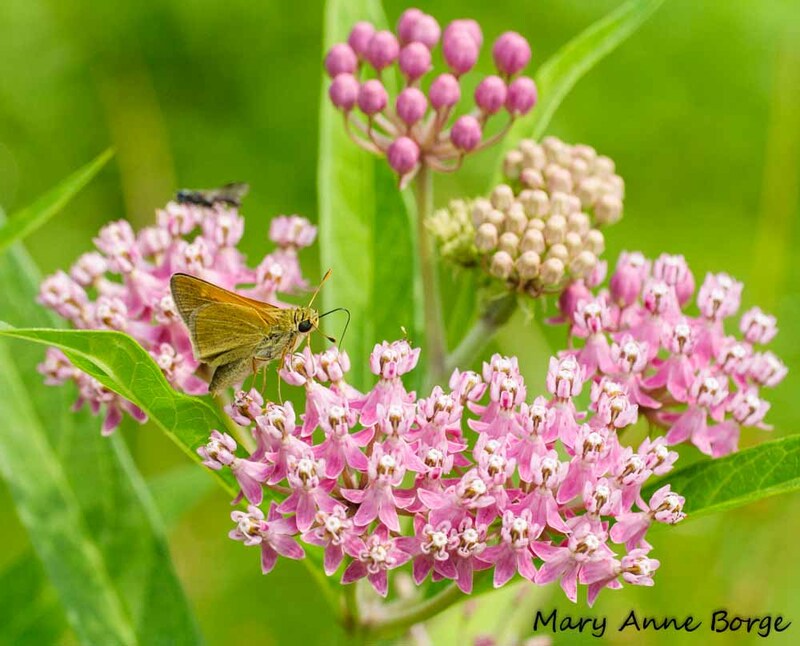 In your article, I learned a lot about all the different species that are part of the Milk weed ecosystem. I will not look at them with such a hard eye as they all have their place it seems. It’s amazing how interconnected all the species are, including us humans! Thank you for such an informative article. I live in southeastern CT and I have been allowing the common milkweed to grow in the backs of my gardens and along the hedgerows for several years now. Each year there are more and more plants. I always see many different butterflies but seldom monarch caterpillars or any caterpillars for that matter. Today I just saw dozens of caterpillars and with your article was able to identify them as Milkweed Tussock Moth caterpillars. Not what I was hoping but exciting anyway. I tend to let nature take its course with the milkweed plants. I do remove the dead plant in the spring. Is there anything I should be doing to encourage their growth? It sounds like you’re doing the right things. Common Milkweed will spread both by seed and its underground root system. It sounds like you are letting any seeds disperse. 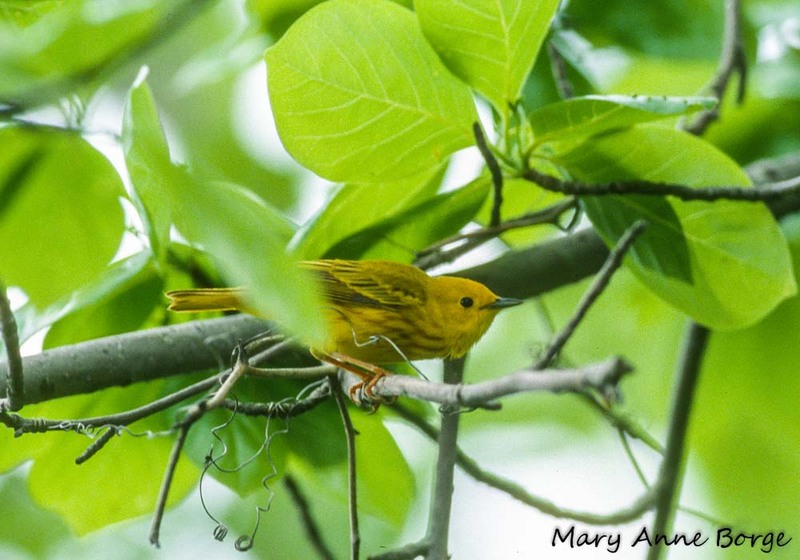 After you cut them, you may want to leave the plant stems some place that is accessible to birds so they can use the fibers for nesting material. Keep up the good work! 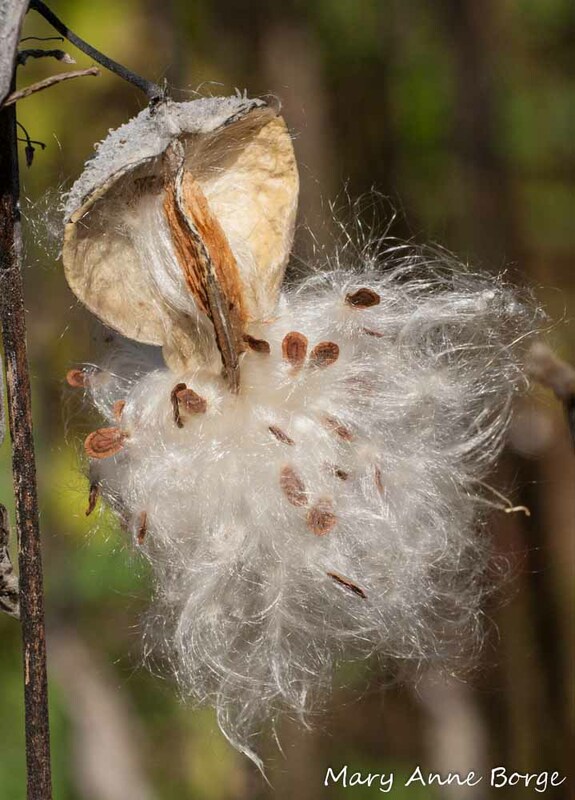 What a great informative article on all the different benefactors of the milkweed plant. Caterpillars would be such easy prey to catch esp for birds so to compensate for their lack of self defense abilities relying on a plant that makes them toxic to predators is amazing!!! Very well written and easy to understand even for a novice. Thanks! The connections in nature never cease to amaze me! Thanks for sharing the post, Bette! I have a question. I have recently noticed a sort of symbiosis between the milkweed beetles and the seed pods. I like to harvest the seed but, if I wait until the pods are open, I miss out on a lot of it. This year, I noticed that if I see the bugs on a pod or pods for several days, that is an indication that the pod will be opening within a few days so I know to watch those pods closely. The seeds dont seem to be chewed on or eaten and, just as the pod starts to split, the bugs move on to another pod. Has anyone else noticed this? An interesting observation. However the entire family Lygaeidae are called seed bugs for a reason: they eat mostly seeds. It may be worth for others to add to this observation. Please, do not call them beetles. They are bugs or Hemiptera, an entirely different taxonomic group than beetles or Coleoptera. Moreover, the larvae of milkweed beetles feed on the roots of milkweeds, the adults nibble the leaves. Thanks for the clarification, Beatriz! Jan – I agree that this is a very interesting observation. Just to clarify, are you referring to the Red Milkweed Beetles (Tetraopes tetraophthalmus), or the Small (Lygaeus kalmii) or Large (Oncopeltus fasciatus) Milkweed Bugs? If you mean the Red Milkweed Beetles, I don’t know of an association between them and the fruit capsules (follicles), and haven’t noticed the behavior you describe. As Beatriz says in her comment, they are foliage feeders, but maybe there is something on the surface of the fruit capsules that they can eat when the capsules are at a certain stage of development. Both the Milkweed Bugs are seed feeders, they lay their eggs on or near the fruit capsules, so it’s possible that that is what the bug was doing. Thank you! Ever since I planted my raingarden years ago I’ve enjoyed watching the interactions of my now diverse insect population and wondered what all those little red black guys are. That red milkweed beetle has been one of my favorites. It’s almost cartoony. Milkweed really hosts an amazing diversity of critters. wonderful article, says it all! But a question has come up: does the milkweed benefit from being the sole food plant of the monarch caterpillar? And how? There is some pollination benefit but other insects are better pollinators at present. Good question! I think the Monarchs come out the winner in this relationship. For the Milkweeds, the only benefit from the relationship on which I could speculate is that often, as a result of plants being eaten, the plants are stimulated to produce more of the chemicals that protect them, perhaps helping to protect them from more damaging herbivores. 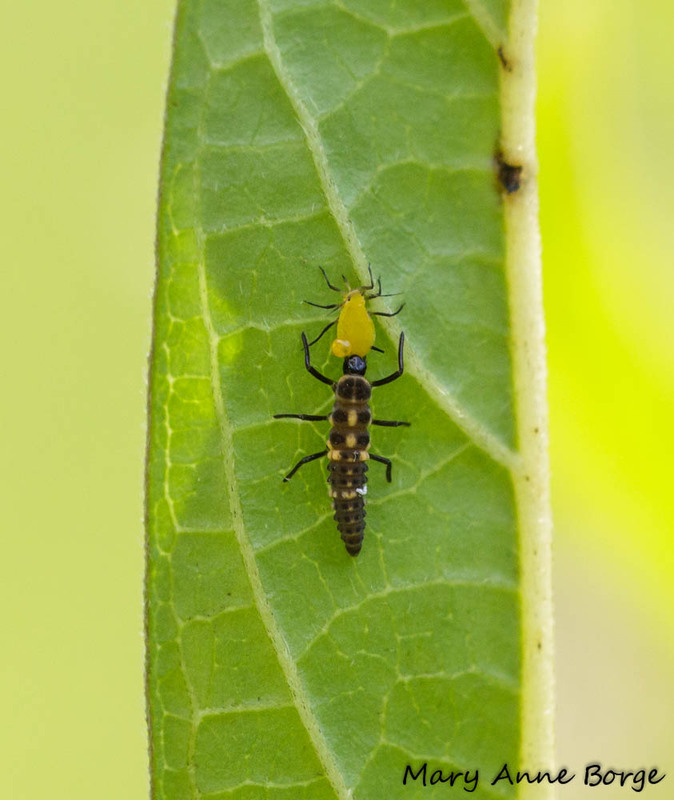 It’s hard to believe, but the aphids can actually be beneficial to a plant. They cause the plant to produce more protective chemicals, which can help protect the plant from other herbivores. They attract ants, who eat the honeydew they produce. Ants also help protect the plant from herbivores. Or the aphids might be eaten by another critter, as you suggest. The bottom line is, the less we interfere, the better. Zelus and other predators had plenty of food before the arrival of the invasive oleander aphid. I wouldn’t worry too much about the elimination of oleander aphids, as if that was possible. Sigh! Destroying this invasive species would help restore the ecosystems to their original balance. Just planted two swamp milkweeds this spring so I am looking forward to seeing who visits. This has been a rainy spring and summer so far so the plants are getting what they like. around here, may have hitched a ride from the nursery where I bought them. I’m not sure whether or not it is true of aphids, but some insects have the ability to detect plants from a long distance. Oleander aphids have spread wider than the oleander plant. They can be found as far north as Canada, while oleander needs a warmer climate and is only found in southern regions of North America. I don’t know where thwy spend the winter, but every year they start showing up around this time and multiply to astronomic proportions by the end of the fall. Congratulations, I cannot think of a more worthy person than YOU, Mary Anne!! Thanks, Deedee. You’re too generous! Thank you sharing this fascinating information on Monarchs and other insects. Beautiful photos capture it all in incredible detail! What a terrific set of photos. I hope to see more sometime. I, too, have been pondering about all the wildlife that depends on milkweeds. Here is my contribution, and we still haven’t began to scratch the surface. So much to learn! This is great information with fabulous photos. And you’re right – this is just what we know about. There may be so much more! Thanks for sharing this link, Beatriz! Loved the article, the photos are fabulous!! I hope this will encourage more people to plant Milkweed! I hope so, too! Thanks, Deanna. What a wonderful and informative article. Fairly new to planting milkweed and this helped identify some of the creatures I’ve seen on some of my plants. Thank you! I’m glad you found this helpful. 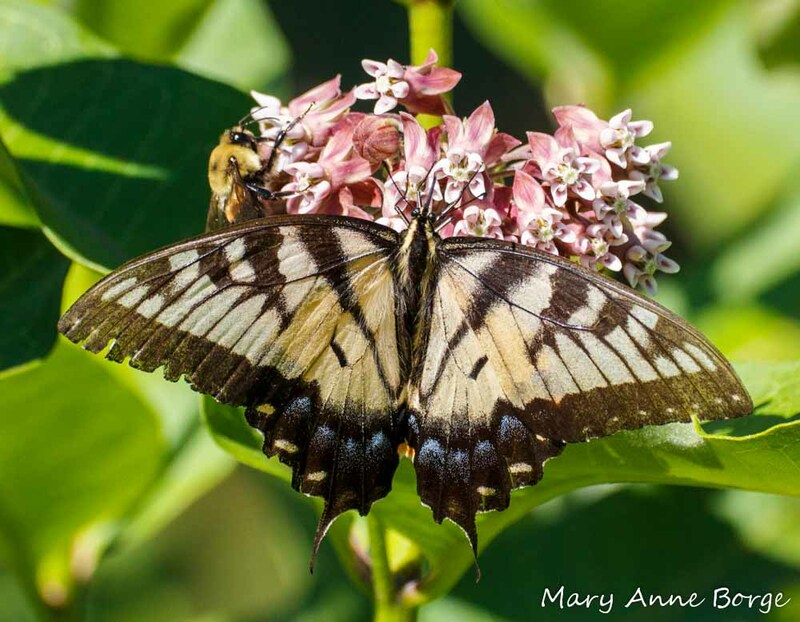 Enjoy your milkweeds, and their visitors!
? What can I do to get rid of the orange and black assissin bugs, they are eating my plant and eggs? Hi Bertha, Are you sure they are Assassin Bugs? 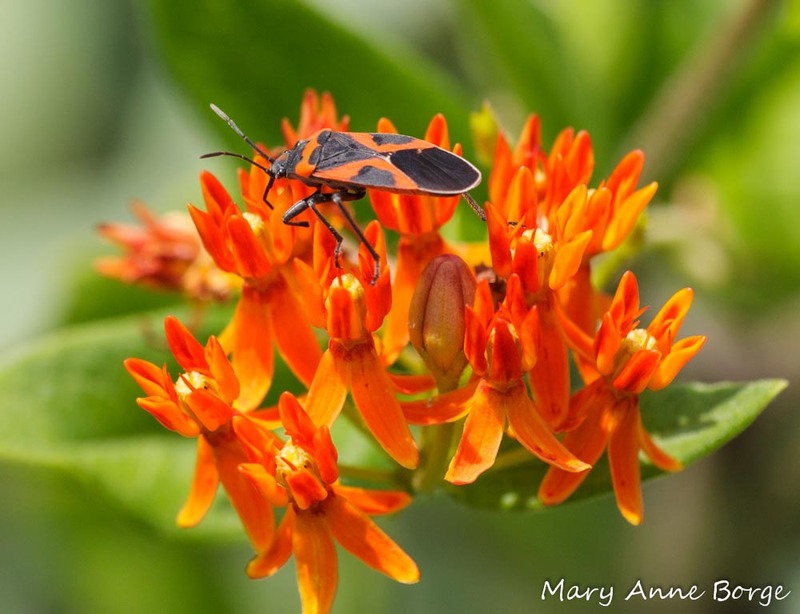 Large and Small Milkweed Bugs both eat Milkweed seeds, but shouldn’t bother your eggs or caterpillars. Red Milkweed Beetles eat the tips of leaves, but aren’t interested in animal protein, either. Assassin Bugs wouldn’t be eating your plants. My advice is to let nature sort it out. That’s great! So many critters will thank you by visiting. What a very lovely article, and fabulous photos. Thanks so much!